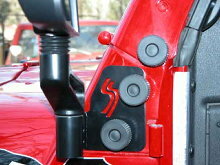 These mirror relocation brackets are designed for the mirrors that came on 1997-2002 Jeep TJ's. They come with all the mounting hardware including hand knobs to make removing them a snap. The other nice thing about them is that they attach to the sides of the upper part of the windshield hinge instead of to the lower part. This makes installation MUCH simpler since the nuts are actually retained within the windshield frame, unlike the nuts on the cowl which typically spin if you try to remove the bolts. The TJ mirror relocation brackets are designed for the mirrors that came on 1997-2002 Jeep TJ's and can be used on later model TJ's if the earlier model mirrors are used.